This pendant has been lovingly crafted by an artisan in Cambodia, mentored and supported by Rajana. Rajana is an organisation giving young, vulnerable Cambodian people the opportunity to be trained in the production and marketing of contemporary craft. Rajana supports a positive and safe future for young people by providing employment with fair wages in a secure and healthy environment and fosters holistic personal development, where possible within their village or local area. This product has been made using recycled shell casing left over from the devastation of the Vietnam war and represents a powerful story of transformation that mirrors the lives of so many Cambodian people. It is truely something beautiful, full of hope and life, created by precious hands out of something ugly, hostile and discarded. Dimensions: Pendant, 3cm long x 1.5 cm wide. Necklace, 48cm total loop length and 22cm drop when fastened. 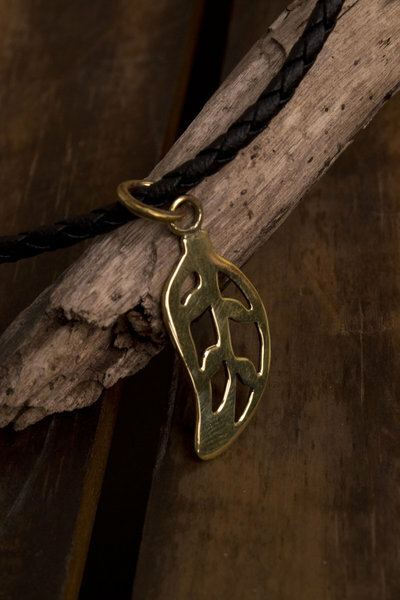 Features: Solid brass, recycled shell casing pendant with hand engraved leaf design on a woven leather necklace strap. The fastener is an easy to manage 'S' hook (please refer to the picture).